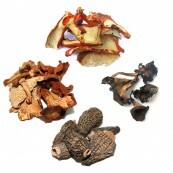 > Dried Mushrooms>Morels>Dried Morel Mushrooms 1 Lb. Dried Morel Mushrooms 1 Lb. Morel mushrooms are widely appreciated by gourmets. They are among the most treasured of all the wild harvest mushrooms because of their superb taste and elusiveness. The fresh morel season typically runs from March through July. Morel mushrooms are widely appreciated by gourmets. They are among the most treasured of all the wild harvest mushrooms because of their superb taste and elusiveness. The fresh morel season typically runs from March through July. Dried morels, on the other hand, are always in season! With its nutty, meaty, and deep woodsy flavor, the well-known Morels are often paired with cream or white wine sauces and milder tasting meats, such as veal or chicken. It can also be sautéed in a light oil, and eaten whole with just salt or soy sauce. 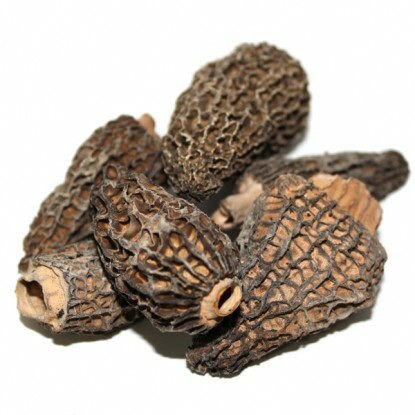 Morel mushrooms provide antioxidants that protect healthy cells from disease formation. Consuming morel mushrooms may improve liver function. The nutritional content of morel mushrooms provides several health benefits, including cardiovascular and weight loss support. The vitamins and minerals in morel mushrooms improve bone density, heart function and energy.